Malcolm Gladwell, who has lately been criticized about his book Outliers, in which he wrote about the 10,000 hours rule, has written as response in which he defends his position. In his piece, Complexity and the ten-thousand hour rule, he mentions the origin of the the 10,000 hour figure, which was a publication by Herbert Simon and William Chase, who estimated that the best chess players spent perhaps 10,000 to 50,000 hours staring at chess positions. Then, Gladwell mentions the work by John Hayes, who found out that the best classical composers in all but three cases did not create their greatest work until they had been composing for at least ten years. 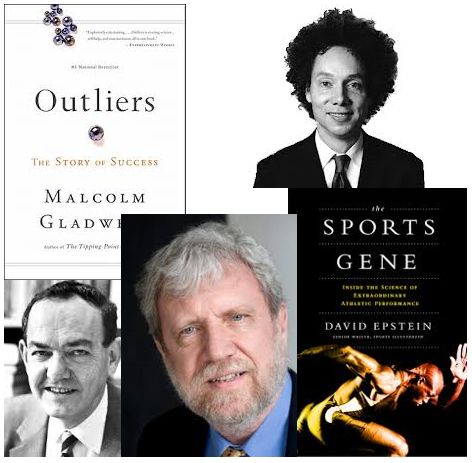 Gladwell goes on to explain that in Outliers he explicitly mentioned the essential role of several other factors besides practice to achieve elite performance. First, he explicitly acknowledged the role of talent; second, he mentioned that elite performers invariably had access to lucky breaks or privileges or conditions that make all those years of required practice possible. Gladwell goes on to discuss one of the more thoughtful critics of his book and thus on the work of Anders Ericsson which is an important pillar on which the book is based, David Epstein's new book The Sports Gene. Epstein acknowledges the important role of deliberate practice but says that there is considerable variation in the number of hours required to achieve elite performance. He mentions examples of individuals who have reached the top in their game in substantially fewer hours. Also, he argues that a slow runner will never become a fast runner. He argues that some people are naturally gifted for sports and therefore need fewer hours of practice. Gladwell has two points of criticism to Epstein. First, he says that some examples in the book in which the performer needed fewer hours of practice do not really seem to be examples of elite performance. Second, he points out that Epstein may have built a straw man argument. That someone who is not a fast runner may not be able to become a fast runner does not undermine the essence of what Simon and Chase, Anders Ericsson, John Hayes, and Gladwell have been writing about. Running in a straight line is quite a different task than composing a symphony. The '10,000 hours writers' have particularly referred to cognitively demanding fields. Performance domains differ enormously from one another. One domain is much more cognitively demanding than another. This is also the case in sports. Some sports may be cognitively lees demanding than others. For instance, running may be less cognitively demanding than soccer or martial arts. Elite performance is a relative thing. Competition in different domains varies strongly. In a matured performance domain in which there is a strong competition it is much harder to become an 'elite performer' than in another. Special circumstances may temporarily affect the number of hours required deliberate practice. For instance, I can imagine that a new generation of chess players have had a competitive advantage over previous generations in that practice has become much more computer assisted. To reach the top in the game may now require fewer hours of deliberate practice. I think Gladwell is right to say that cognitively demanding performance domains, especially require much deliberate practice in order to become an elite performer. In performance domains which rely a lot on body characteristics, such as running, basketball, etc), deliberate practice may never fully compensate for not having the required bodily characteristics. In performance domains that rely heavily on cognitive characteristics there is much more opportunity develop characteristics because of the great plasticity of the brain. You cannot do much to change the length of your legs but you can do a lot to change the complexity of your brain. Interesting article and much appreciated comment. I do agree that different situations and domains cannot easily be compared. Even so when one acts within a certain domain, it is not always about reaching a top performance. Sometimes it is about just doing the performance and enjoying what one does. In time this can evolve in the urge to perform better. Also comparing sports with more cognitive endeavors is rather difficult. Still, topperformers in sport will tell you that to reach their peak performance they have worked over ten years to get their. So, even there we see a combination of ability/talent with hard work through training: one has to make miles and milies of training.